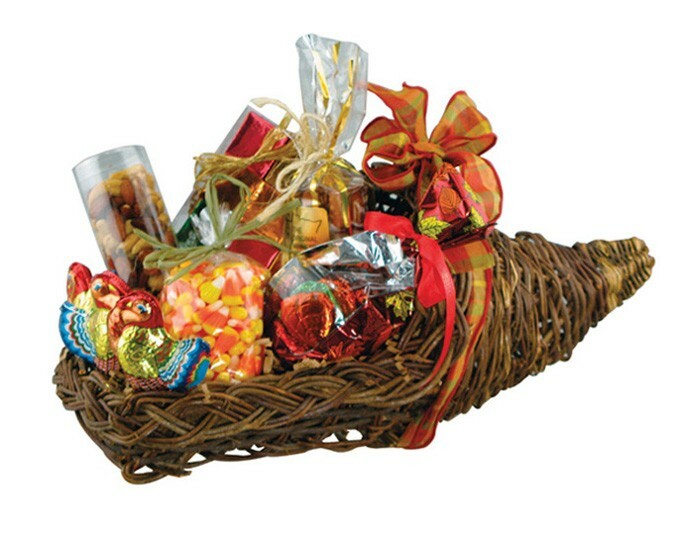 Woven rataan cornucopia gift basket filled with 1-8oz bag of candy corn, 18 pc gift box of fall mint truffles, 1 gift bag filled with 15 foil wrapped solid chocolate candy autumn leaves, 7oz tube of mixed nuts and 10 pc bag of white chocolate candy dipped pretzels. Wrapped in cello and tied with your choice of ribbon color. Makes a great food gift or Thanksgiving holiday gift. Cornucopia basket can be used as a decorative wall sconce. Includes up to 4 color process imprinted label or card attached to the clear cello wrap.. Contents may vary and can be customized to taste or budget.